Company : xStarter Solutions, Inc.
xStarter is a computer task automating utility with options synchronize folders, run Windows applications, compress (archive data), copy files and folders, download files, send e-mails, display pop-up messages, and launch and terminate NT services. Importantly, these tasks can be scheduled to be run on a set time, after some pre-defined time or periodically. Also they can be started after some system event occuring (e.g. NT event log). Sick of repeating the same tasks? Want windows to do the boring repetitive actions for you? Automate Windows with xStarter. xStarter is like having the ability to write your own programs without doing any programming and it is very easy to use- It is designed for people with only basic computer skills. xStarter allows you run a series of programs from one key press or at a time you decide. Most programs you use are typically limited to one task. To get useful work done most of us need to run a series of programs such as: Opening a report (spreadsheet) Importing some data from a file (using a spreadsheet macro) Save and close the spreadsheet Zip the spreadsheet (compress it) Back up the spreadsheet to CD (your personal backup) Dial up the internet Email the zipped file as an attachment to your boss Sit and check the file has been sent Disconnect from the internet Delete the data file Make a coffee and take a break ! This whole complicated and time consuming sequence can be run by xStarter � FROM A SINGLE KEYPRESS. OK so it won�t make the coffee but it will pop up a message on the screen (or email) if the process fails, so you can do something about it, before the boss starts asking . Do you ever check windows event viewer for system error reports ? No ? You should - it may contain vital warnings that your system is about to fail or backups not completing. Get xStarter to pop up a message each time a warning is generated. Another example: You can monitor NT events for a particular error , take a screen shot and then email it your IT staff complete with time, date and user information � all automatically. Automate internet and network Connections: Automate internet connections � dial up silently � this stops users interrupting the dial up. 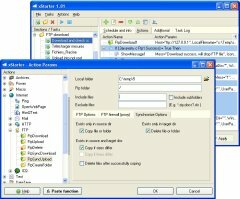 Download files from an FTP site. For example - virus definitions. Automate connections to network shares.